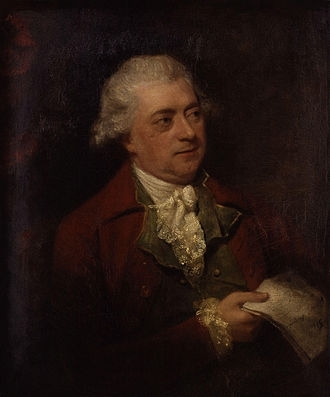 John O'Keeffe (24 June 1747—4 February 1833) was an Irish actor and dramatist. He wrote a number of farces, amusing dramatic pieces and librettos for pasticcio operas, many of which had great success. Among these are Tony Lumpkin in Town (1778), Love in a Camp (1786), and Omai (1785), an account of the voyages of the Tahitian explorer Omai, and Wild Oats (1791). In 1777, O'Keeffe moved to London. The following year he wrote Tony Lumpkin in Town, a sequel to Oliver Goldsmith's She Stoops to Conquer, and sent it to the manager of the Haymarket Theatre. 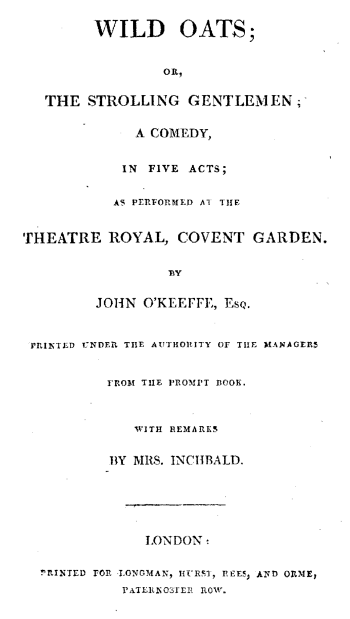 The play was successfully produced, and O'Keeffe regularly wrote for the Haymarket thereafter. In 1782 O'Keeffe had his two children sent abroad to France to deny access to them by their mother. His son did well but his daughter suffered in convent schools. Between 1782 and 1796, O'Keeffe wrote around 28 plays and librettos for comic operas. The Poor Soldier (1783), a comic opera with libretto by O'Keeffe and music by William Shield, was a farce about the lives of British soldiers returning home after the American War of Independence. O'Keeffe also wrote The Son-in-Law, Agreeable Surprise which includes the lyrical poem Amo, Amas, and The Castle of Andalusia. O'Keeffe had problems with his eyes ever since he had fallen into the River Liffey in his youth. From the mid-1770s, O'Keeffe increasingly lost his sight, and from 1781 his plays had to be dictated by him. In spite of this he was a prolific writer and was the most produced playwright in London in the last quarter of the 18th century. O'Keeffe contributed many Irish folksongs to the musical scores by Samuel Arnold and Shield such as I am a Friar of Orders Grey and The Thorn are still popular. For many of these songs, the comic operas are the earliest source. From 1788 his adolescent daughter Adelaide wrote for him. She was his amanuensis and eventual carer until he died. She also took work and became a writer in her own right. In 1800, a benefit performance was staged for him at Covent Garden. In 1826, O'Keeffe wrote his memoirs, which covered his life experiences and various interactions with the leading artistic figures of his day. The memoirs were dictated to his daughter Adelaide who oversaw their publication. However, much of the information in his memoir is not accurate. In time Adelaide would write her memories of him. The same year he was awarded a pension by George IV. He died in 1833 in Southampton and was buried there.--Wikipedia. Epub 20120303.epub If you cannot open a .mobi file on your mobile device, please use .epub with an appropriate eReader. Mobi/Kindle 20120303.mobi Not all Kindles or Kindle apps open all .mobi files.